Building tree houses is the perfect career for a carpenter with an imagination who also happens to be an ISA Certified Arborist (#PD-2026A). Dan Wright went out on a limb in 2003 when he founded Tree Top Builders, but it wasn’t without precedent. Tree house construction was actually the culmination of several of his past life experiences. He and his dad built a tree house when he was 8 years old. He used it year round, whether to stockpile water balloons or snow balls. A few years later, he built a 41 foot high tree house platform, zip line, climbing wall, and ropes course at a youth camp in New Hampshire. Over the years, he helped maintain and facilitate the use of 4 different challenge courses. Finally, after gathering years of carpentry experience as a custom ground house builder, he branched out into the treehouse realm. 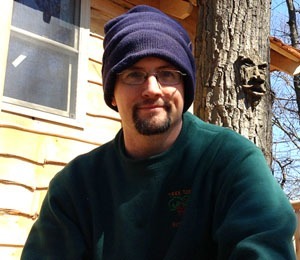 Building Tree Houses came relatively naturally to Dan, but he nevertheless committed himself to learning the best practices of building smarter, safer treehouses. He read the work of the late Dr. Alex Shigo and Dr. Claus Mattheck and learned how trees respond to wounds; which is essential to choosing the right tree house fasteners for each specific application. He partnered with and learned from countless arborists and networked with other treehouse builders around the world. Their decades of experience provided Dan the insight he needed to develop and improve the best tree house fastening systems; as well as the knowledge to provide follow up tree care on treehouses all over the country. Dan is well respected by other professional tree house builders on both coasts of the US. One of the greatest joys of building tree houses is working alongside other treehouse professionals, combining decades of experience and expertise, and focusing our collective knowledge on making the best possible tree houses. Dan Wright is a talented carpenter, a friend of trees and the outdoors, and can wield a circular saw with amazing skill. He is involved in all aspects of Tree Top Builders from design, carpentry, climbing, and office work. Dan is available for tree house consulting and design appointments, as well as speaking with the media, and guest writing. But good luck catching him when he’s not hanging from a rope somewhere building a treehouse! 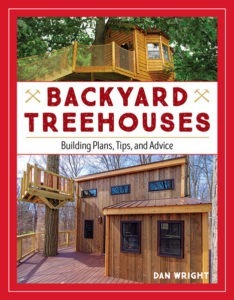 Backyard Treehouses is an inspirational how-to book for the do-it-yourself enthusiast to build their own treehouse while minimizing the impact on their trees and build something that is safe and enduring. It’s designed for those with limited time and funds to build something great for their families. With step-by-step color photos, building plans, helpful tips and sidebars, master carpenter and treehouse builder Dan Wright demonstrates the range, from simple to more complex, of what a treehouse can be, and how it can enhance the backyard lifestyle. To purchase the book, follow the link to our sister company Treehouse Supplies.